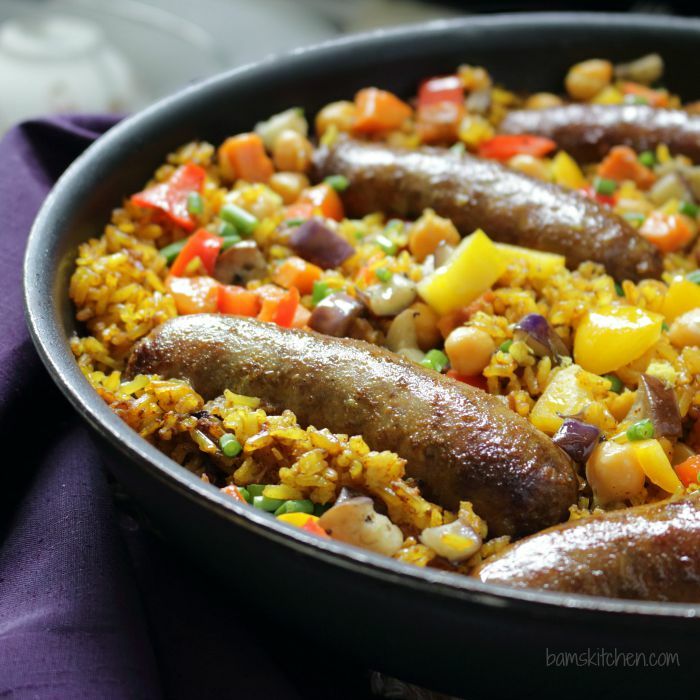 One-Pan Moroccan Sausage Paella is filled with warming spices, colourful seasonal vegetables of the autumn harvest, savoury sausages and brown rice. 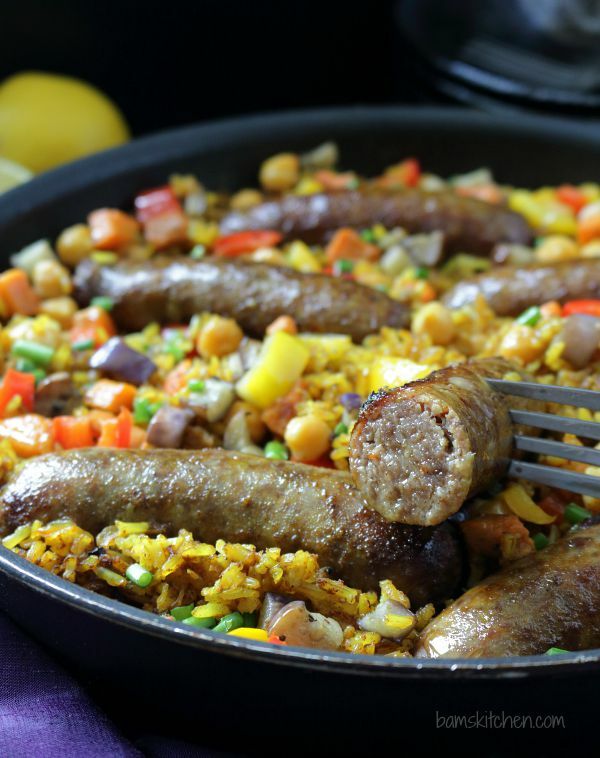 One bite is all you will need to know that your body was craving this delicious Moroccan Sausage Paella. From the aroma of the earthy cumin, warming ginger, turmeric and cinnamon to the savoury onions and garlic these spices were meant to cure what ails you and a perfect immune booster during the cold and flu season. I like to use seasonal veggies and currently pumpkin, Asian eggplant, peppers, and garlic chives are readily available here in Hong Kong. 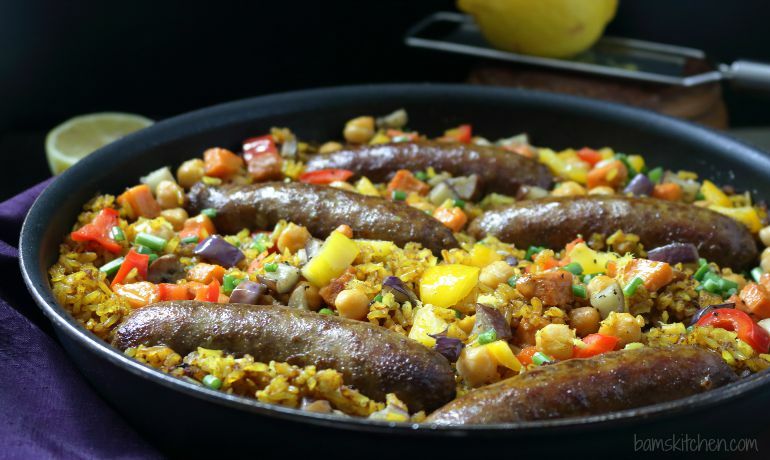 Feel free to use what veggies you have in your crisper in your Moroccan Sausage Paella. If you can't get out and about, even a mixed bag of frozen mixed veggies works just fine. 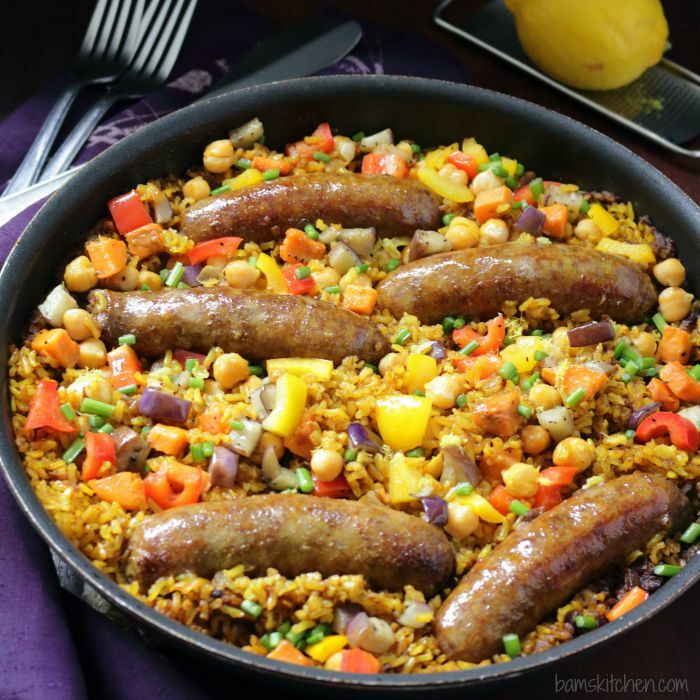 I used an organic gluten-free chicken sausage with apples for myself so my Moroccan Sausage Paella was mild and slightly sweet and lower in fat and calories. However you could use regular mild or hot Italian sausage like I did for my boys (photos displayed here are all with mild Italian Sausage) or even a vegan sausage if you would like. 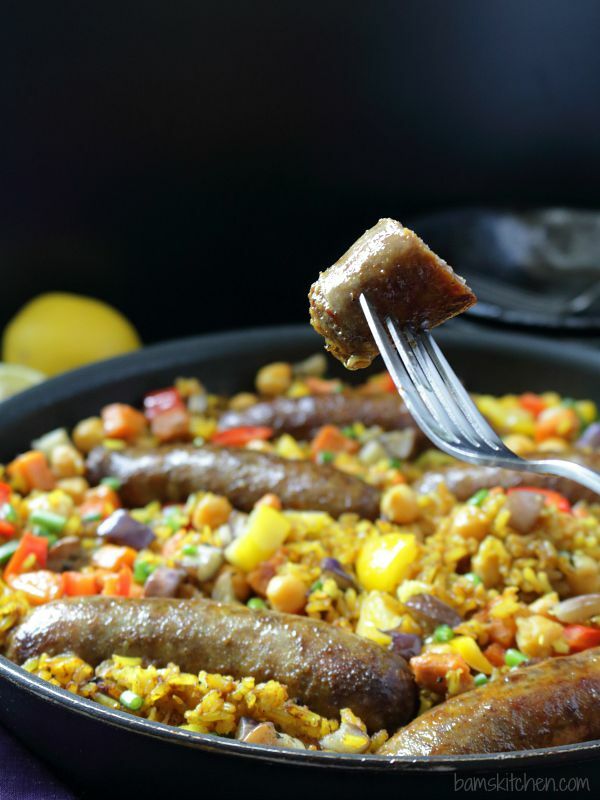 The sausage is cooked in the pan and then when you add the rice and chicken or vegan broth it gets all of the delicious flavours and tasty bits off the bottom of the pan and this is what makes this dish so flavourful. I am quite partial to traditional Seafood Spanish Paella but this is a fun kick on an old classic for the cooler months. I used brown rice for this dish but if you want to shave off 10 minutes of cooking time, use white rice. I love the fact that you only dirty one pan and you even serve your Moroccan Sausage Paella in the same pan. My pans are all small and my boys appetites are quite bit so I ended up making 2 medium-sized pans of Moroccan Sausage Paella. No worries, leftovers are even better the next day. Thank you everyone for commenting on Negima Yakitori with Grilled Mushroom Bam's Kitchen 4 Year Blogiversary post. The mighty Rafflecopter God has spoken and Shashi from Runnin Srilankin was the winner of the Japanese Chopstick sets. We are delighted to hear your requests for the recipes that you would like to see here on Bam's Kitchen. We have made a short list of the requests and you will be seeing those in the upcoming posts. So stay tuned. Thanks so much for reading and please join us on Facebook, Twitter, Instagram and Pinterest for more recipes and to find out what is going on in Bam's Kitchen. 1In an iron skillet or large 28/30 cm skillet (Required: Must have a lid that fits your skillet/pan), add your olive oil and add your Italian sausages (gluten-free chicken and apple sausages, etc) and brown gently on all sides but not cooked through. (Remove sausage from pan and keep warm) Add onion and garlic to the pan you just cooked the sausage in and saute gently then add the cumin, cinnamon, turmeric and paprika in the pan and saute for just a minute or 2 until your kitchen smells amazing. Then add the brown rice and stir well to coat all the rice with the spices. 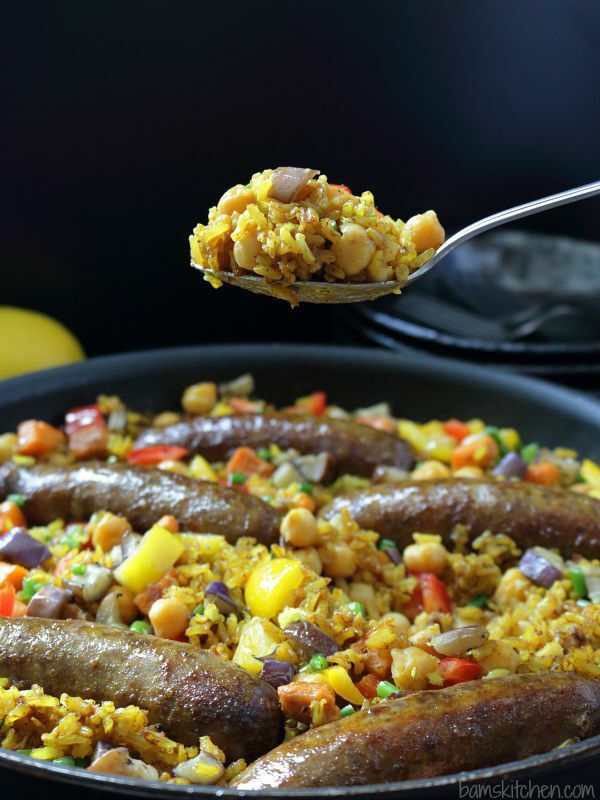 Add 2 and 1/2 cups of chicken/vegetable broth to the pan and use your wooden spoon to get all of those delicious browned bits off the bottom of the pan as that is what makes this moroccan sausage paella delicious. Now add the browned sausages back into the pan and put the lid on your pan and allow to slowly come up to a boil. Reduce the heat and gently simmer for 20 minutes. 2Add the squash/pumpkin or any firm vegetables you wish to add to the Moroccan Sausage Paella and just nestle them within the rice. Put the lid back on the paella and continue to gently simmer for 20 minutes more. 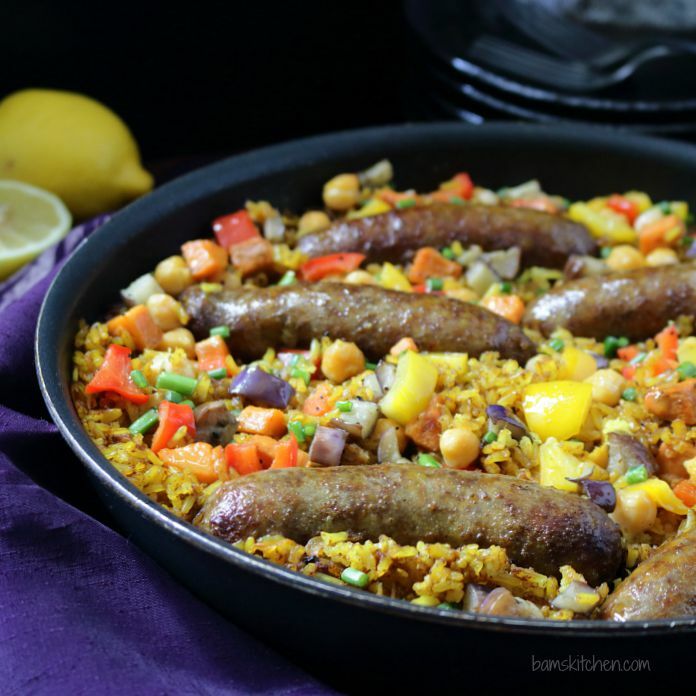 4Garnish your one pan Moroccan Sausage Paella with a drizzle of lemon juice and lemon zest and enjoy!